COMING SOON! LOTS OF GREAT INFORMATION ABOUT JOBS, SCHOOLS, AND OTHER AREA INFORMATION! Here we provide information, links, pictures, maps, and other local information for local communities. Contact us if you need information you can’t find here and we’ll research for you. We live in Fremont but we know areas all over southern New Hampshire. 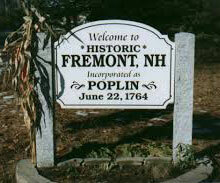 Fremont was once part of Brentwood known as Poplin, which was incorporated as a separate town in 1764. In 1783, by act of Legislature, Daniel Brown and 20 other families were split from Poplin and annexed to the Parish of Hawke (Danville) for parochial purposes. The Town’s name was changed to Fremont in 1854, in honor of the very popular General John C. Fremont. General Fremont was the first candidate of the Republican Party in the presidential election of 1856, losing to James Buchanan, and the first territorial governor of Arizona, 1878-1883. Epping is growing! Situated at the intersections of highways and byways of southern NH Epping has been growing. Beach goers stop in Epping on their way to Hampton Beach. The area is a popular route to the mountain region for thos wanting to avoid the interstates. Motorcyclist pass through on warm summer days headed for touring rides through the scenic areas north of Epping. The area was once the domain of the Squamscott Native Americans, a sub-tribe of the Pennacook nation, which fished at the falls where the Exeter River becomes the tidal Squamscott, the site around which the future town of Exeter would grow. On April 3, 1638, the Reverend John Wheelwright and others purchased the land from Wehanownowit, the sagamore. Wheelwright had been exiled by the Massachusetts Bay Colony, a puritan theocracy, for sharing the dissident religious views of his sister-in-law, Anne Hutchinson. The minister took with him about 175 individuals to found the town he named after Exeter in Devon, England. Local government was linked with Massachusetts until New Hampshire became a separate colony in 1679, but counties weren’t introduced until 1769.